Hansen "was never muzzled even though he violated NASA’s official agency position"
Hansen "embarrassed NASA by coming out with his claims of global warming in 1988"
Marc, First, I sent several e-mails to you with an error in the address and they have been returned to me. So I'm resending them in one combined e-mail. Yes, one could say that I was, in effect, Hansen’s supervisor because I had to justify his funding, allocate his resources, and evaluate his results. I did not have the authority to give him his annual performance evaluation. He was never muzzled even though he violated NASA’s official agency position on climate forecasting (i.e., we did not know enough to forecast climate change or mankind's effect on it). He thus embarrassed NASA by coming out with his claims of global warming in 1988 in his testimony before Congress. Marc, Indeed, it was a pleasure to see you again. I appreciate the opportunity to add my name to those who disagree that Global Warming is man made. A brief bio follows. Use as much or as little of it as you wish. John S. Theon Education: B.S. Aero. Engr. (1953-57); Aerodynamicist, Douglas Aircraft Co. (1957-58); As USAF Reserve Officer (1958-60),B.S. Meteorology (1959); Served as Weather Officer 1959-60; M.S, Meteorology (1960-62); NASA Research Scientist, Goddard Space Flight Ctr. (1962-74); Head Meteorology Branch, GSFC (1974-76); Asst. Chief, Lab. for Atmos. Sciences, GSFC (1977-78); Program Scientist, NASA Global Weather Research Program, NASA Hq. (1978-82); Chief, Atmospheric Dynamics & Radiation Branch NASA Hq., (1982-91); Ph.D., Engr. Science & Mech. : course of study and dissertation in atmos. science (1983-85); Chief, Atmospheric Dynamics, Radiation, & Hydrology Branch, NASA Hq. (1991-93); Chief, Climate Processes Research Program, NASA Hq. (1993-94); Senior Scientist, Mission to Planet Earth Office, NASA Hq. (1994-95); Science Consultant, Institute for Global Environmental Strategies (1995-99); Science Consultant Orbital Sciences Corp. (1996-97) and NASA Jet Propulsion Lab., (1997-99). As Chief of several NASA Hq. Programs (1982-94), an SES position, I was responsible for all weather and climate research in the entire agency, including the research work by James Hansen, Roy Spencer, Joanne Simpson, and several hundred other scientists at NASA field centers, in academia, and in the private sector who worked on climate research. This required a thorough understanding of the state of the science. I have kept up with climate science since retiring by reading books and journal articles. I hope that this is helpful. 1. CO2 growth at current (1988) growth rate. 2. CO2 emissions are held constant at 1998 levels. 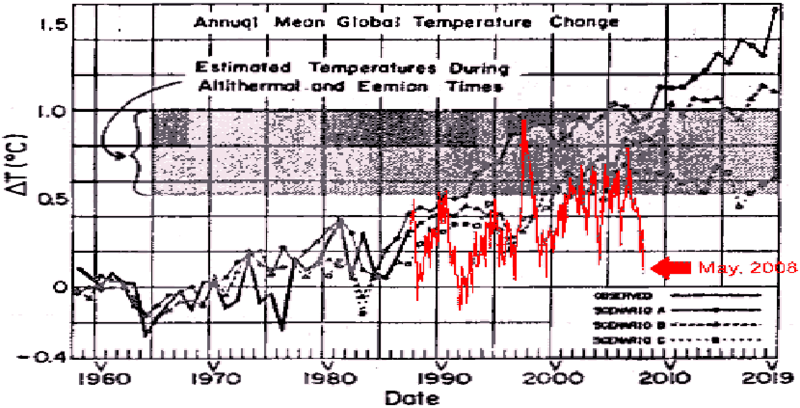 We did not drastically cut CO2, but the actual temperature (red) did not rise as he predicted. “The West Side Highway [which runs along the Hudson River] will be under water. And there will be tape across the windows across the street because of high winds. And the same birds won’t be there.